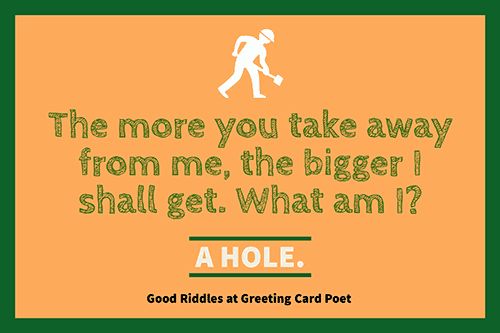 Although this grouping of good riddles may force you to use your noggin more than you’d like, in the end, you’ll be entertained and glad you did. Riddles vary widely because they aren’t about punchlines at all. Instead they’re about the “kick of the discovery,” thinking one way and then suddenly turning that thought pattern around. This collection was crafted with riddles that are just as tricky as they are entertaining and provides a wide variety for all ages and abilities. Stretch your mind and solve then all! I can be cracked, made, told, and played. What am I? I wiggle and cannot see, sometimes underground and sometimes on a tree. What am I? I like to twirl my body but keep my head up high. After I go in, everything becomes tight. What am I? I can fly but have no wings. I can cry but I have no eyes. Wherever I go, darkness follows me. What am I? Although I may have eyes I cannot see. I have a round brown face with lots of acne. What am I? I am a seed with three letters in my name. Take away the last two and I still sound the same. What am I? I am lighter than air but a hundred people cannot lift me. Careful, I am fragile. What am I? I am the type of room you can not enter or leave. What am I? What five letter word can you take away two letters and have one remaining? What goes in the water black and comes out red? With three eyes and a black as night, I frequently knock down ten men with a single strike! What am I? I’m white, perfect for cutting and grinding. For most animals I am a useful tool. What am I? I am always around you but often forgotten. I am pure and clean most time, but occasionally rotten. What am I? I have two bodies joined together as one. When standing still, I ran and ran. What am I? The more you take away from me, the bigger I shall get. What am I? What loses its head in the morning and regains it at night? I jump when I walk and sit when I stand. What am I? I have fangs and enjoy piercing holes with a single bite. What am I? What makes a good riddle? Well the simple answer is: a good riddle is one you like. For as we all know, we all have different taste. A riddle that you like is not necessarily good because someone else does or does not like it. If it works for you; it works. How do you know if Santa is really a werewolf? How does the Easter Bunny paint all the Easter eggs? He hires Santa’s elves during the off season. I wonder what vampires put on their turkey at Christmas? Grave-y. Puns and Jokes for Kids. What weighs more a pound of feathers or a pound of iron? Same – it’s one pound. What three positive numbers give the same answer when multiplied or added together? Dave can pick up cigarette butts from the ground and make a cigarette with 4 butts. If Dave finds 16 cigarette butts, how many cigarettes can he make? Five. He makes the initial 4 with the 16 (16 divided by 4 = 4). Then, after smokes the four, he has four more butts to make one more. 4 + 1 equals 5. If you have 23 black socks, 17 blue socks and 12 white socks on the floor in your dark closet, how many would you have to pick up to ensure you’d have a matching pair? It’s Valentine’s Day! What reindeer do we see on this day? I’m tall when I’m young, I’m short when I’m old, and every Halloween I stand up inside Jack O Lanterns. What am I? What stories does the Easter Bunny like best? The ones with hoppy endings! What day does an Easter egg hate the most? Fry-days. Check out our Awesome Puns page. What did Santa change his name to after he slid down a chimney where the fire was still burning? I have three letters. I read the same forward and backwards. And, I know you’ll get the answer, I know you’ll see. It’s a word that is important to you and me. What word am I? 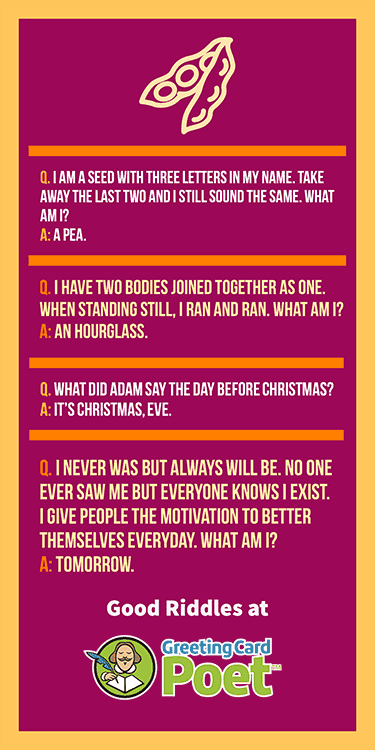 If you’d like to add to our riddles with answers page, please submit your ideas via the contact page. I never was but always will be. No one ever saw me but everyone knows I exist. I give people the motivation to better themselves everyday. What am I? I reach for the sky, but clutch to the ground; sometimes I leave, but I am always around. What am I? Why should you not iron a four leaf clover? Because you would be pressing your luck! Santa just ate his walking stick! How is that possible? It was a candy cane! What does Rudolph do that bugs Santa? What happens if you eat the Christmas decorations? What happens to you at Christmas? What is Santa’s favorite basketball team? The New York Old St. Knicks. What is the expected outcome of a cross between a Honeycrisp and a Christmas tree? What is the weather called when it is raining turkey? What song do socks sing while they hang by the fireplace? Silent Night — HOLEY Night. What’s at the end of Christmas? What’s the best thing to put into a Christmas cake? What’s the kind of toe that should not belong on your foot? Where does Santa put his suit after Christmas? 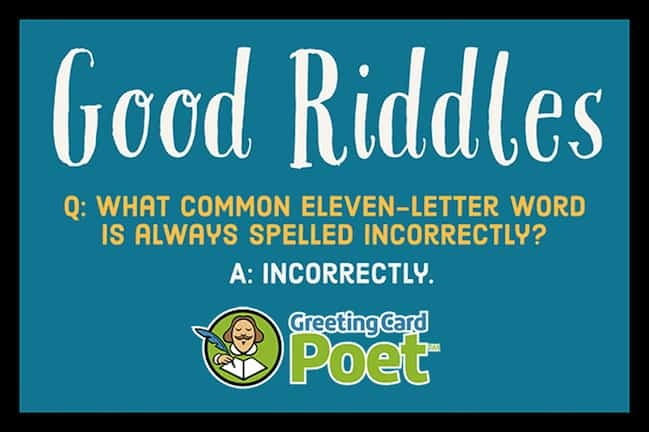 Tip: These good riddles make great inclusions in kids’ lunch bags. Which reindeer is known to be the fastest of them all? Which reindeer loves to go to outer space? Who delivers Christmas presents to dogs? Check out our dog puns. Why are Christmas trees like bad knitters? They always drop their needles. Why can’t the Christmas tree stand up? Why shouldn’t you tell an Easter egg a joke? 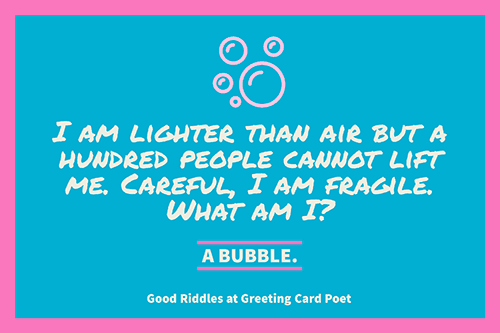 We hope you liked this sparkling collection of unsullied humor that we call good riddles. You can find many other categories on the links below. You’re on Good Riddles with Answers page.